How was the Darvaza gas crater formed? 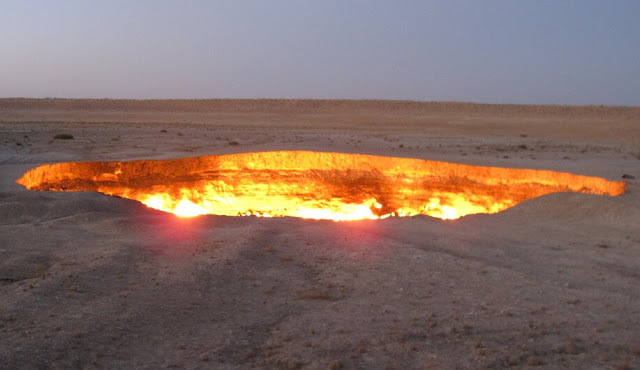 The gate of hell is not a place that has always been there, but its history goes back to the 70s, created following an accident when Turkmenistan was still part of the Soviet Union. It was formed in 1971, when Soviet geologists carried out prospecting works in the area thought to be a substantial oil field site. The engineers set up a drilling rig and operations to assess the quantity of oil available in the site. They did not notice that they were located above a natural-gas pocket, which collapsed and swallowed all their equipment. The incident did not cause casualties, but large amounts of methane escaped from it, a gas that makes it difficult to breathe. To avoid spreading of poisonous gas into nearby towns, the engineers decided that it was better to set the crater on fire so that the methane was quickly consumed; something common in these cases. The problem is that those responsible did not know how much gas was in the field: they thought the fire would last for a few weeks. The fire was expected to use all the fuel in a matter of days, but it has continued to burn for more than four decades and is still burning today. Which offers a hot but lovely show in the day and especially at night. That makes this destination, so curious. The locals give the name of “Door to Hell“ in reference to the continuous burning. Although in 2010 the president of the country ordered to seal off the hole, so far no action has been taken. 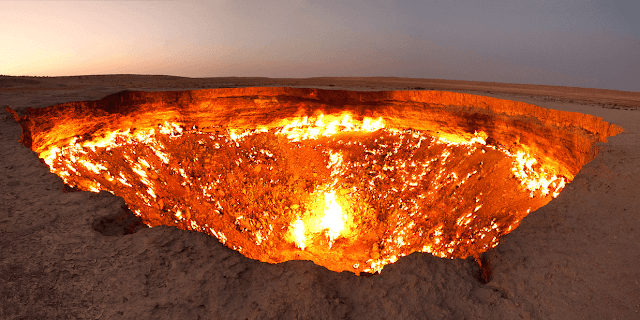 The door to hell attracts not only tourists but also spiders. The possible explanation for this is they are attracted towards the heat & light of the pit.